(CNN) -- A man who entered the presidential building in Belgrade, Serbia, Thursday armed with at least one hand grenade surrendered to police after several hours inside the building, a journalist with Serbia's national news agency said. 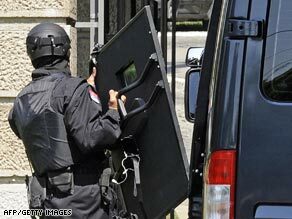 Armed police have surrounded the presidency building in central Belgrade. "The drama has ended. The man surrendered a few minutes ago," Borislav Korkodelovic, a senior editor at Tanjug, told CNN. "Normally he would be charged in the next 48 hours, but we do not know what the charges will be because we do not know what his psychological state" is, the journalist said. U.S. Vice President Joe Biden, who is visiting the region, left Belgrade shortly before the crisis began. He met Serbian President Boris Tadic on Wednesday. The man, who has not been identified, apparently bore a grudge against the national airline JAT, claiming it had stolen millions of dollars from him. "A rather complicated financial story, if it is true at all," Korkodelovic said. The crisis began when the man removed the pin from the grenade at the building's entrance, the Belgrade radio station B92 reported. "Numerous" police were inside the building, and traffic in the area near the building was blocked, the radio station reported. Tadic's office declined to say if the president was in the building at the time.